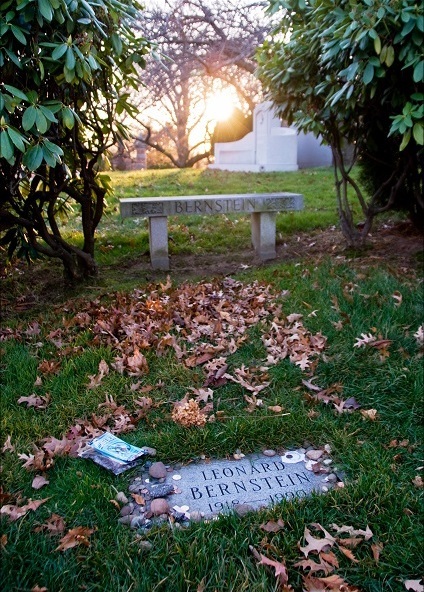 A narrative of the author's visit to the home of Leonard Bernstein. 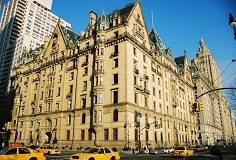 The landmark building erected on Manhattan's Central Park West between 72nd & 73rd Streets in the 1880s was soon afterward dubbed the Dakota because of its then-isolated New York City location. Featured in several films (including Rosemary's Baby), it's been home to Boris Karloff (a fitting tenant, given the structure's Gothic atmosphere), Truman Capote, and John Lennon, who was murdered outside the entrance. Actress Lauren Bacall, widow of Humphrey Bogart, resides there even now. 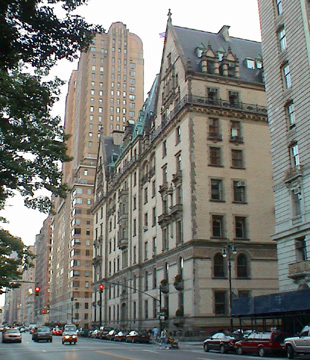 On the next block, between 71st & 72nd Streets, during the early years of the 20th century, stood the Hotel Majestic. Almost prophetically, it was there that an upper-floor suite was occupied by Gustav Mahler during his first season in New York. The suite in which he lived with Alma and their daughter overlooked Central Park. (Mahler's view of a fireman's funeral prompted the ominous bass drum strokes in the last movement of the uncompleted tenth symphony). It seems providential that a geographical proximity now exists between Mahler and the man who was destined to become the older composer's most exponential interpreter: Leonard Bernstein. 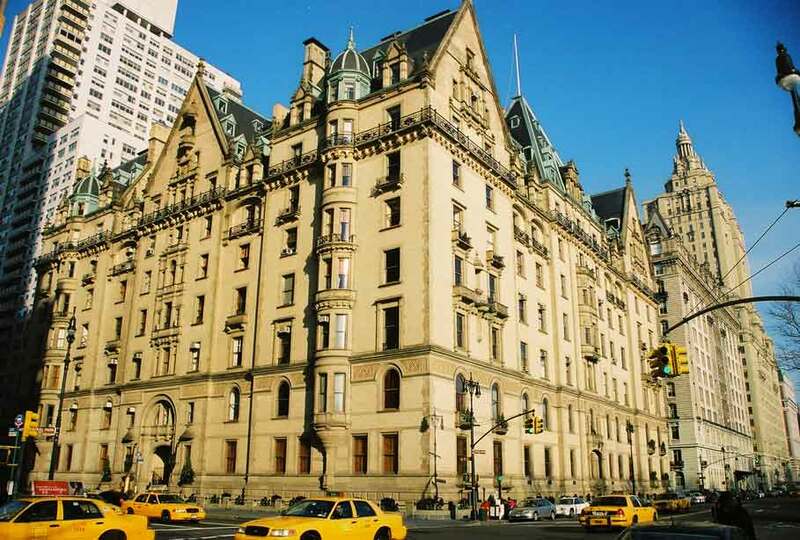 Born seven years after Mahler died, Bernstein spent the last 16 years of his own life living in the Dakota -- in an apartment overlooking Central Park. I must forsake authors' anonymity and take a personal role in offering the following account. 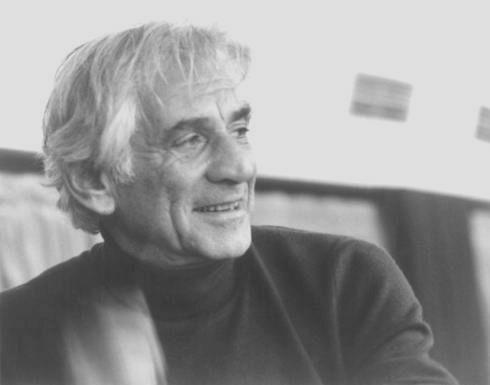 In mid-March, 1993, I received an invitation to an April 19th recital, "Bernstein -- Broadway and Beyond", at the Society for Ethical Culture on Manhattan's West 64th Street. The pianist would be Christopher Drobny, the vocal soloist Louise Edeiken, a young singer who, at the composer's own request, had premiéred Bernstein's song cycle, Arias and Barcarolles. The performance was sponsored by the BETA fund (Bernstein Education Through the Arts), an entity led by the composer's son, Alexander. What made this particular invitation special, even unique, is that it entitled me to attend a reception at Bernstein's own apartment at the Dakota -- thirty months after his passing, but ultimately none the worse for it. 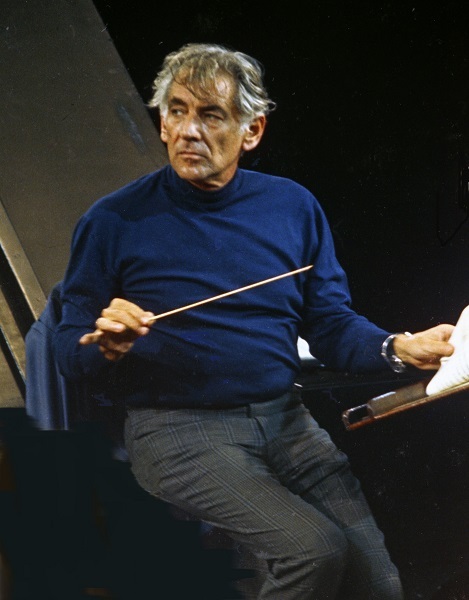 Leonard Bernstein died at 6:15pm on Sunday, October 14, 1990, so I expected the changes of time to have had their effect on the apartment by the passage of two and a half years. The surviving dwellings, some now museums, that Beethoven occupied in and around Vienna would in all likelihood be totally unrecognizable to him today after so many decades: in most cases nothing from his tenancy survives in these rooms except the spaces themselves. In the case of Felix Mendelssohn it's just the reverse: most of the original furnishings from his own living room, including a Johann Baum grand piano attributed to the composer's ownership, were (as of 1987) exhibited in Leipzig's Old City Hall, in a space Mendelssohn never occupied but which was created to house the furnishings. Brahms, too, has also been so "memorialized": the Vienna building at Karlsgasse 4, where he lived for the last 26 years of his life, was ceremoniously demolished on April 3, 1907, exactly ten years after he died there. Some of the furnishings are now displayed in a special room in the Haydn Museum in Vienna. It should surprise no-one that even the passage of several months can bring surprising changes in people, circumstances, and the physical nature of our surroundings. 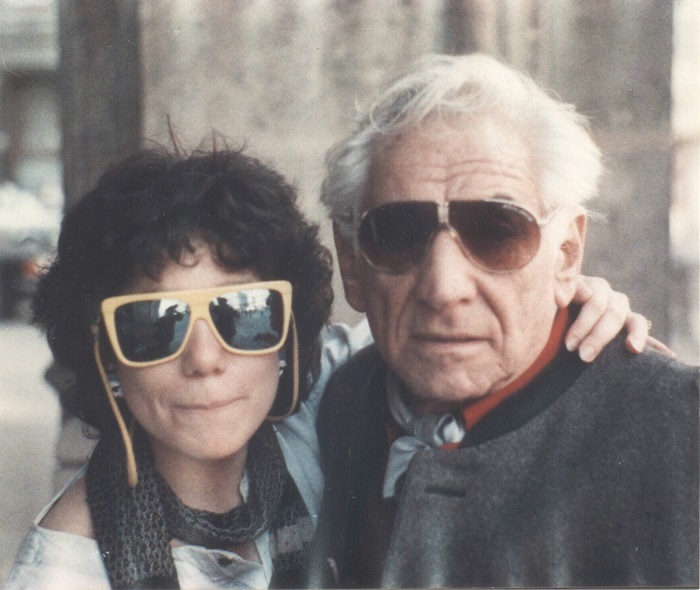 Personal experience proves that our entire world can change color for us even in an instant -- but it seemed the Bernstein apartment had remained just as it was when he lived there. This cannot be proved. It can only be felt -- the more so, as his apartment appeared to be exactly as I recalled seeing it in photos and videos made while he actually lived there. Everything now seemed still in place; it was my first visit yet everything was familiar, giving a new significance to the concept of deja vú. What returned to me now was the feeling I had in Franz Liszt's house on Marienstrasse in Weimar, Germany: the dwelling seemed so filled even with a residual presence of the man himself that I half expected him to enter at any moment and greet his visitor ( -- my personal concept of a new, singular, and real miracle). In both locations it was an atmosphere difficult to describe, impossible to explain, but very easy to recognize -- particularly because of the parallels between Liszt and Bernstein as pianists, composers, conductors and educators. 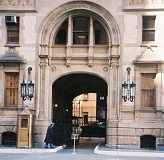 Access to the Bernstein apartment was from the entrance to the building at Nr.2 West 72nd Street. I found myself walking through a labyrinth of long corridors -- almost disproportionately narrow, but which had walls that seemed 20 feet high. Dark paneling gave the surroundings a somewhat solemn, somber ambience. Prompted by this, I now heard (from within, not from without) the "March to the Scaffold" from Berlioz' Symphonie Fantastique ( -- as rendered, of course, on the New York Philharmonic recording by Leonard Bernstein). Turning some corners, I arrived at an ornate, black wrought-iron staircase leading to the 2nd floor, where I stood in a large vestibule at the far end of which were large, dark wood double-doors with brass numerals: Apartment 23. I knocked at the door -- and was admitted to the Bernstein residence. Prematurity can provide advantages. I was one of the first to arrive and this gave me a chance to look around. Though only the sitting-room/salon, living room, and dining room were "accessible" as the reception areas for this evening's guests, the rooms were large, bright, and very ample, well-appointed and filled with antiques of all kinds, including match-strikers containing the specific kind of matches they were meant to hold, photos of Bernstein and his family and friends, bookshelves practically up to the nearly 15-foot-high ceilings, the shelves overflowing with volumes on all subjects; LP, CD and video tape recordings abounded, along with their respective apparati; I glanced through a book about Bernstein printed in Polish; the various items I could see that were actually intended for personal use by the Maestro and his family are simply too numerous to mention. Dominating this sitting-room was a 2-manual Dowd (Boston) harpsichord, atop which were more photos. The ultimate fate of this instrument, as well as so many other Bernstein possessions, was decided at the Sotheby's, New York auction of much of his estate in early December, 1997, at which I was a bidder. 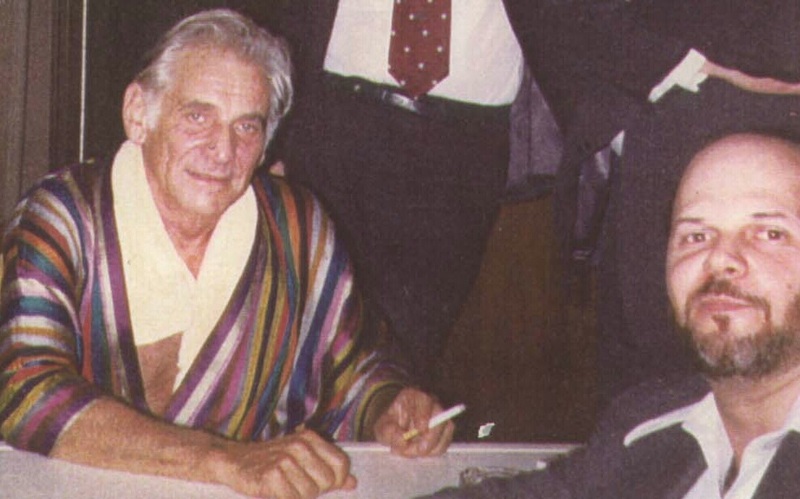 In addition to his pencil-case (replete with pencils of all kinds) and a silver cigarette case he had owned, I had been eager mainly to acquire the multi-colored, striped silk robe that the Maestro often wore in greeting his visitors after his concerts. 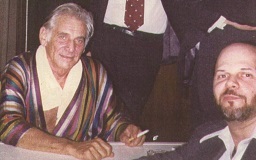 I have a personally inscribed photo of both of us, in which he is wearing that very robe. The photo was taken by my wife, Marie, on June 6, 1979, after a concert of Schumann (1st symphony) and Shostakovich (5th symphony). Alas, I was unsuccessful in my bidding, but it was comforting for me to know the robe went to a fitting recipient from Germany, a then-student of conducting. By name Anke Weinert-Wegmann, she and I are thankfully still in touch. I walked into the living room, which, like Mahler's eight decades before, faced Central Park. My view from the window brought to mind a passage in a letter Prokofiev had written in the 1920s to a friend in Russia: "As I walked through the enormous park in the middle of Manhattan, I thought with a cold fury of the wonderful American orchestras that cared nothing for me or my music." Evidently Leonard Bernstein had as much deserved luck as Prokofiev had had undeserved misfortune. Near a window were yet more photos, the centerpiece of which was a silver-framed picture of John F. Kennedy, personally inscribed to Bernstein. Most of these photos rested atop an enormous Bösendorfer grand piano (which Bernstein called his "B-52"). I thought of the parallels between this piano and Mahler's own: both jet-black, and both massive, in keeping with the magnitude of both composers' work. Now at Vienna's Kunsthistorisches Museum, in the Sammlung Alter Musikinstrumente (Collection of Antique Musical Instruments), Mahler's piano was made by Julius Blüthner of Leipzig ca.1902 and was donated to the Museum in 1948 by Mahler's daughter, Anna (1904-1988), a sculptress specializing in the human figure in massive form. Like Bernstein's Dowd harpsichord, his Bösendorfer piano was also sold at the Sotheby's auction and was purchased (by a doctor) for nearly $400,000. Since people were now arriving at the apartment, to minimize disturbance I played only a quick, pianissimo c-minor chord in the upper register; if not by technical definition, then surely by common usage this validates my claim that I have played Leonard Bernstein's piano. Though the Bernstein children live elsewhere, they retained the 8-room apartment for numerous reasons and stayed there on occasion. I was told it also served as a headquarters for the various enterprises in which the Bernstein children are involved. (Alas, this has changed, more about which, presently). Soon there were several dozen people present. I shook hands and spoke with Jamie Bernstein Thomas, Lenny's daughter and his eldest child; and I saw (but didn't have a chance to speak with) his sister, Shirley, who has since passed away. I was later told that Bernstein's youngest child, Nina, was also there briefly (and that she had even arranged the catering for the event! ), but alas I didn't get to meet her. I had met Alexander Bernstein in mid-January after a seminar at the Museum of Television and Radio in Manhattan, and tonight I had the pleasure of speaking with him again during the course of the evening. At one point I told him that the Nothing Ventured, Nothing Gained principle applied here, and I asked him if it would be possible for me to see his father's studio, even if only briefly, and I added that if he'd allow it, it would frankly mean a great deal to me. "I know it would, but I just can't", he replied, with a clearly sincere regret in his voice. Well, there was certainly no harm done; I told him I understood entirely, which was true; that simply to have the opportunity to be here on this evening was, for me, a privilege in itself (also true); and there was no question that what I was seeing and experiencing here this evening was well worth the visit. I soon learned that the maestro's own private studio was isolated on one of the upper floors -- very appropriate positioning, since even though he was 5'8" tall (by coincidence, my own height), he towered above most of us musically. I also learned that the studio was being prepared for the organization of the Leonard Bernstein archives. To have visited this apartment remains a personal experience which I can describe only as unique, just as my having heard Bach's music performed in his own Thomaskirche in Leipzig remains as one of the most moving musical experiences of my life. 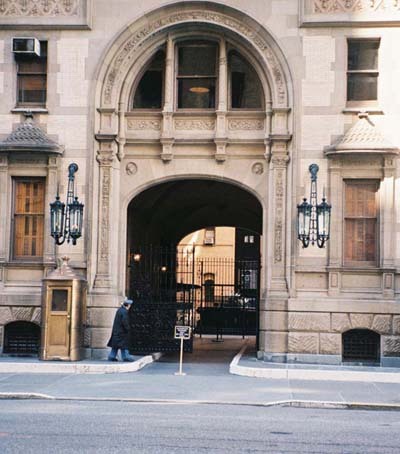 The feeling of euphoria was as intense as my feeling of sorrow and even fury when, in June 1997, I had the gut-wrenching experience of passing by the Dakota and seeing workmen gutting the apartment: it had been sold by the Bernstein family. It was of course their decision to do so, and our decisions are justified as long as they are honest and that they satisfy us. Nevertheless, the personal sadness and rage that I felt defies description. One incident in particular stands out in my memory more than others about that Dakota evening. -- On the piano's music rack were three scores: by Chopin (the Mazurkas), Ravel (the piano transcription of Le Tombeau de Couperin), and a volume of Bernstein's own music, the Bernstein Songbook, marked on the front cover in red pencil, CORRECTED. I glanced through this printed edition and noticed red-pencil markings and corrections to this score -- markings in what appeared to be Bernstein's own note-hand for the notation alterations, and in his own letter-hand for the marginal prose remarks. To the left of the music rack was a holder with various ordinary, "garden variety" pencils -- including a RED one… I must admit to the thought of merely placing this simple red pencil in my pocket, but I fought and overcame the temptation: I decided just to HOLD the pencil in my hand for a moment, not to "take" it forever, and I returned it to its holder. Yes, it would have been a cherished and very personal keepsake for me, and I'd have been forever its custodian, but it remained in its receptacle. We're responsible only for our actions, not for our thoughts -- and certainly not for our dreams. 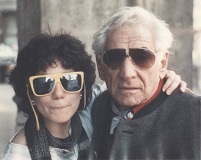 I had known Leonard Bernstein casually when I was a student. I make no pretensions at having been "a close personal friend" of his (though I do wish I had been). I consider myself fortunate that I knew him even as an acquaintance. We were not intimate friends in the traditional sense, yet we were not total strangers, either. This peripheral view has a perspective others may not: we can't see the picture if we're inside the frame. There are of course many people who knew him even in this casual way, but it's very pleasing -- it's even a source of pride -- for me to know that I am one of them. Something of a role model for me during my formative years, he may have been, essentially, moments in my personal weather -- but they were moments that had a profound effect on the climate of my life. 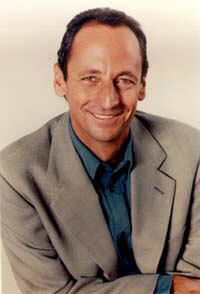 Jeffrey Dane is a researcher, historian, and author whose work about the literature, materials and practitioners of music appears in numerous countries and in various languages. His book, "A Composer's Notes -- Remembering Miklos Rozsa", was published by iUniverse for the Rozsa centenary. He has been a contributor to other volumes, including "Leonard Bernstein: A Life" by Meryle Secrest, and has written other articles about Bernstein. He has also co-authored a book, "Creating Texas: A Brief History of the Revolution", just published by Lauric Press (in Allen, Texas).